The overworld, as seen in New Play Control! Pikmin. The Pikmin games consist of areas, which are locations that can be explored. In Pikmin 2, each area contains three or four entrances to caves. In the main games of the series, areas are large locations that need to be explored over the course of days. 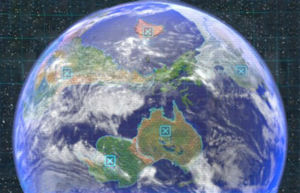 There is initially a single area available, and others are unlocked throughout the progression of the game by completing certain objectives. For instance, to access to the Perplexing Pool in Pikmin 2, a specific treasure, the Geographic Projection, must be collected. At the start of each day, a menu is presented to the player, where they can choose which area to explore in. In Hey! Pikmin, areas are organized into groups called sectors. Each area is like a level in a platformer game. It's traveled from start to finish, and at the the end, the area is over, and the player advances to the next one. That said, it is still possible to replay areas and collect treasures or use alternative exits that have been missed. The Pikmin Park can also be accessed from the sector selection screen. Each sector has a proper name, but in some places, it is referred to with a number. 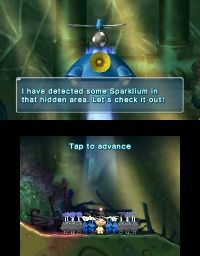 Each sector includes four normal areas, a secret one, a boss area, four Secret Spots, and a Sparklium Spring, with the exception of the last sector, which is made of only one area. Though not thoroughly confirmed, it's been heavily implied that some areas in Pikmin 2 are in fact from Pikmin, albeit changed. The Awakening Wood has the same layout as The Forest of Hope. It has been implied by Olimar that these are the same location, as read on his journal about the Geographic Projection. Likewise, the Perplexing Pool shares the same layout as The Distant Spring. The Wistful Wild is a bit different, as it consists of both The Impact Site and The Final Trial. The Valley of Repose is not a remade version of The Forest Navel or any other area from the first Pikmin game and is completely new. 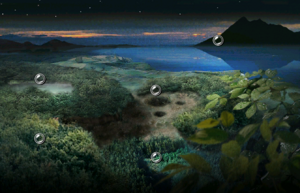 All areas in Pikmin 3 are original, while the forest shown in the title screen is almost the same as the west wing of the Awakening Wood. This is best seen with a model viewer, because of the water and angles. This comparison is detailed here. The Mission Mode stage Forgotten Cove, is a remade version of the The Forest Navel. The Forest of Hope's radar pattern on top of a map of the Awakening Wood. The Distant Spring's radar pattern on top of a map of the Perplexing Pool. The Impact Site and The Final Trial's radar patterns on top of a map of the Wistful Wild. Animation comparing the Pikmin 3 title screen with the Awakening Wood. Discovering the secret exit in Below the Ice. Normally, in Hey! Pikmin, exploration of each area starts at one point and ends in another, and when an area is finished, the one whose letter comes next in the alphabet becomes available. But some areas have a secret exit, usually behind some hidden path or challenge. If the player finds the S.S. Dolphin II's pod at the secret exit, it will comment on how it found an extra area with some Sparklium, and will recommend Captain Olimar to go check it out. At the area selection menu the path that opens connects to an "X" area, instead of the next letter of the alphabet. When this alternative area is completed, it leads to the letter after the area that the player skipped, meaning that regardless of the player taking the regular path or the secret exit, they will have to complete the same number of areas to reach the sector's boss. The following is a list of areas with secret exits, and where they end up. Cavern of Confusion Mushroom Valley Cherrystone Pass Near the end of the area, there is a patch of ground that goes down when Olimar steps on it. When it stops, there is a small fake wall to the left, leading to a doorway. On the other side, there is a wooden stake that needs 16 Pikmin to be pushed into the ground. Behind it stands the ship's pod. Glowing Bloom Pond The Shallow End Treacherous Currents Right before the normal exit, there is a bridge, and after that, three Bloominous Stemples. The player can fall down the bridge if it's unbuilt, or just go down through the Bloominous Stemples, and it will take them to a doorway leading to the secret exit. Crystal Tunnels Echo Cavern The Hollow Sky At the end of the last pit of the area, filled with crystals, there are two exits: one going to the normal exit to the right, and one to the left, blocked by a crystal. The player can break this crystal if they have at least one Rock Pikmin. On this path, the player will encounter a Crumbug, with the ship's pod nearby. Pollution Pool Space of Silence Drenchnozzle Den The player has to dive in one of the first ponds of the area, next to a doorway, with Blue Pikmin only. The player has to throw a Pikmin at a Starnacle's eye, in order to get access to a doorway. On the other side, Olimar has to break dirt blocks to continue in the secret path. He can go through a doorway to retrieve his non-aquatic Pikmin, before heading to the right and reach the secret exit. Valley of the Breeze Downpour Thicket Gale-Force Glen In the last pit of the area, there is a small branch at the left that serves as a landing spot for Olimar. After that, there's a small path that leads directly to the secret exit. Scorched Earth Lights in the Darkness Sizzling Precipice Near the end of the area, the player must extinguish a huge patch of fire and destroy a dirt block. However, the player must be quick, because a Fiery Dwarf Bulblax stands above the patch of fire, and will eventually fall on the player. If this happens, then Olimar must kill the enemy. Behind the dirt block stands a small path that leads directly to the secret exit. Above ground, terrain varies between Pikmin games. It has no real impact on the gameplay, but it does change the atmosphere and the different types of enemies that may be encountered. Most areas in Pikmin have natural surfaces such as sand, soil and wood. Grass: Found in most areas. Soil: This is what the leader and his Pikmin will be walking on for a majority of the time. Soil is found in every area in the game. Sand: Usually, when there is water, there is sand, especially in The Distant Spring. In it, about half the amount of land is submerged in water, and that amount of land is sand. It can also be found in the small pond area in The Impact Site and the large lake in The Forest Navel. Stone The rimstone lake section of The Forest Navel is mostly made of stone. Some sections of The Impact Site include stone. Most of the general area surrounding The Distant Spring is made out of mossy cut stone. Wood: Various tree stumps can be found in the game – in The Impact Site, The Forest of Hope and The Distant Spring. Bridges are made out of wood and can be walked on. Cardboard: The cardboard boxes in The Impact Site, The Forest of Hope and The Final Trial can be walked on by using a nearby rock as a platform. Rusted metal: In The Final Trial, large slabs of rusted metal are used to cross the body of water separating the landing site from the area where the player battles against the Emperor Bulblax, which actually takes place in a large metal "bowl" like arena. In Pikmin 2, the player will find a vast array of different types of terrain. Snow: In some caverns, one may find the area to be covered in a blanket of snow. This terrain can be found in the Valley of Repose and its respective caverns. Grass: A common terrain, mostly found in above ground areas, with the Awakening Wood being a common example. Grass-like terrain can be found in the Perplexing Pool; however, considering the area's aquatic nature, it's possible that it's actually moss. Wood: As in the first game, tree stumps can be found, most notably in the Perplexing Pool. Sand: The Perplexing Pool has sand surrounding its lakes. Concrete: Can be found in a few areas; most of the Valley of Repose is formed from concrete. This is due to it being a crosswalk of sorts. Tile: This style consists of simple turquoise-colored tile filled floors and walls, which have sand filled in between each tile. Areas with this style usually have water, which is typically found in small descents of ground. The tiles may be interrupted by sand or a metallic floor. Stone formations: Inside the Perplexing Pool, there are odd stones formations that are mysteriously shaped, some of which are walk-able. These odd formations range from simple pathways to maze-like structures. Seesaw blocks: In several areas, there are sets of seesaw blocks. They can be used to lift Pikmin and the leaders to higher areas, and several sets of these scales must be navigated to obtain treasure. Rusted metal: The landing area of the Wistful Wild is actually an old road sign. Glass: Shards of glass and large crystal formations are present and can serve as obstacles or have valuable items encased inside of them. They can be shattered by being continuously hit with Rock Pikmin. Sand: Sand flooring exists in the Tropical Wilds. There is also plenty of sand in several areas of Mission Mode and Bingo Battle. Wood: There are multiple places where wood is incorporated into the terrain. In the Tropical Wilds, wood is accessible to walk on, but has no special features. In the Distant Tundra, frozen wood is incorporated as well as a walkway to the cave where Charlie is rescued. Some clipboards can also be walked on. Snow: In the Distant Tundra, snow can be found blanketing much of the area. It makes a crunching sound when leaders walk on it, similar to that in Pikmin 2. Grass: The most common terrain, it covers most floors of areas and has no special qualities. Rock: Caves are structured from rock, and types range from simple brown rock, similar to that in Pikmin and Pikmin 2, to odd moss-covered rock, looking like granite. Mud: Terrain that exists primarily in the Garden of Hope, mainly in the arena of the Quaggled Mireclops. This terrain may change from water back to mud by the boss' stomps. Lily pads: Lily pads drift along the river, allowing leaders and Pikmin to travel across it and find more sub-areas. Tile: Simple tiling that has sand filled between the cracks. Similar to that in Pikmin 2, but it is only present in very few places. Buckets: A large bucket serves as a bridge to the Quaggled Mireclops' arena. In some Bingo Battle stages, plastic buckets can be found under the Onions. Scales: A set of scales can be found in areas in both Story and Mission Mode. These scales have a redesign from Pikmin 2, and can be used to get to fruits and to further sub-areas. Rusted metal: Metal similar to that in Pikmin 2, but darker and with less or more rust. Pipes: They are unique ways of transport in the Bingo Battle area Rusted Labyrinth. They allow leaders to slide to lower areas, while geysers can transport them back up to the upper areas. Conveyor belts: Conveyor belts are unique ways of transport in the Mission Mode area Clockwork Chasm, with switches to change the direction of movement. These switches can be activated using Pikmin. Bricks: Self-explanatory. Some are found in Twilight River and cannot be interacted with. The Pikmin 2 map screen. The full map of all areas in Pikmin 3. 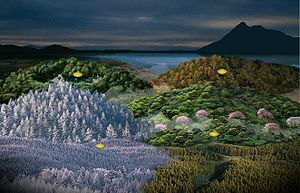 The main areas in Pikmin 2 and Pikmin 3 each represent a season: the Valley of Repose and the Distant Tundra are winter, the Awakening Wood and the Garden of Hope are spring, the Perplexing Pool and Tropical Wilds are summer, and the Wistful Wild and Twilight River are autumn. The names of the areas in Pikmin 3 all have the same number of characters – 14. In Pikmin and Pikmin 2, some meteors appear on the area selection screen's sky, occasionally. A large cluster of them temporarily appears when the last area of each game is unlocked. This page was last edited on April 25, 2019, at 08:07.